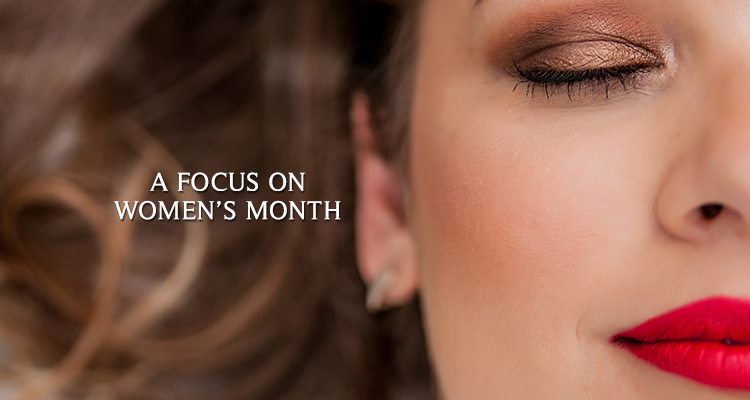 August is Women’s Month and in this month’s newsletter we’ll be focusing on the health of women’s eyes by providing you with amazing makeup tips, the do’s and don’ts of using eye cosmetics, new eye-products and more! The Roman philosopher Plautus (254-184 BC) wrote: “A woman without paint is like food without salt.” Cosmetics have beautified women for centuries. Possibly the earliest record comes from the first dynasty of Egypt as far back as 3100 B.C. Egyptian women decorated their eyes by applying dark green to the under lid and blackening the lashes and upper eyelid. Used correctly, eye cosmetics can make green eyes sparkle, blue eyes glow and brown eyes smoulder. When used improperly, cosmetics can cause infection, allergic reaction and even injury. Some of the most common causes of eye infection are old cosmetics. Bacteria can grow on make-up applicators and bacteria can be transferred to the eye. In most serious cases, improper application of cosmetics can damage the cornea, the front surface of the eye. This often occurs when eyeliner pencils are not properly sharpened and rough wood casings can scratch the cornea. Any corneal injury requires immediate attention. Want to make your eyes a bit more dramatic? Mascara, eye shadow, and eyeliner can certainly do the trick. But if putting on eye cosmetics is part of your daily ritual, you should know about some potential dangers to your eyes. In fact, being just as diligent about removing eye makeup at night is more important than applying them each morning. Don’t hold onto old makeup. Throw it away after a few months. Don’t use mascara that’s dried out. Also, never attempt to moisten it with your saliva or water. It’s best to replace mascara every two to four months, or sooner if it’s dried. A tip: Keep a permanent marker in your make-up kit, and mark the date you open a new tube of mascara, so you won’t use it past its shelf-life. Keep eye cosmetics cool. Don’t keep them in your car or in a steamy bathroom. Don’t mix and match cosmetics. Use what’s intended for your eyes on your eyes only – don’t use the same pencil for both lips and eyes, as that can introduce bacteria. Never share your cosmetics with a friend. Her bacteria will contaminate your eye cosmetics, and vice versa. Never put your eye cosmetics on while you’re driving or riding in a car. Your mascara wand can all too easily scratch your cornea – not to mention the risks of inattentive driving. Skip eye cosmetics when you’ve got an irritated or infected eye. If you think that a particular cosmetic is irritating your eyes, stop using it right away. Keep eye cosmetics outside of your eye. Don’t use eyeliner on the inner eyelids, where makeup can get inside your eye. Always wash your hands before you dig into your makeup bag and start applying eye cosmetics. Avoid eye cosmetics that are iridescent, glittery, or shiny. They may contain ingredients that could scratch or irritate the eye. Make sure that all eye cosmetic applicators are clean before you use them. It’s a good idea to wash or replace all brushes and sponges frequently. Makeup can cause a lot of problems for your eyes, especially if you wear contact lenses. Eyes can become dry and irritated, and cosmetics can leave deposits on your lenses, affecting your vision and the comfort of your lenses. It’s important to carefully and gently wash off your eye makeup each night before bed to make sure that your cosmetics don’t work their way into your eyes, build up, and cause damage. Follow the instructions on the packaging of each eye cosmetic to find out the best way to remove it – some may recommend just soap and water, some a cold cream, and others makeup remover. Most importantly, be gentle when you remove your eye cosmetics, as the eyes and skin surrounding them are very sensitive. Take the same care using removal products as you do with eye makeup – always wash your hands thoroughly before you remove eye makeup. Created by an Ophthalmologist and designed to clean eyelids and eyelashes, Chrissanthie eyelid cleanser & anti-aging eye care is highly recommended by lash experts worldwide as an effective lash cleanser & makeup remover. Safe for eye lash extensions – will NOT break down adhesives. The revolutionary Chrissanthie Eyelid Cleanser & Lid Wipes is a unique anti-bacterial Tea Tree formula created by an Ophthalmologist, and recommended by health care practitioners and beauty professionals worldwide. Chrissanthie anti-aging eye care delivers in terms of nourishing, moisturising, protecting and regenerating the delicate area around the eye, usually the first tell-tale sign of ageing! It offers three remarkable eye care products formulated to prevent and improve the appearance of fine lines, wrinkles, crow’s feet, puffiness and dark circles. The Chrissanthie Eye Care product range is developed by a well-known ophthalmologist and pharmacist in South Africa and is recognised by eye specialists and the beauty industry across Africa, Canada, USA and Europe. Dark circles around the eyes are a universal problem. There are many causes cited for the development of dark circles and they can occur as a result of ageing or even in childhood. Although there is a definite genetic predisposition to this condition, other causes can be related to allergies, for example, hay fever, sinusitis, fatigue and even certain medical conditions relating to the liver and kidney. Puffiness and swelling around the eye may also be due to poor circulation of blood, resulting in a dark, bruised look. More sleep, cold compresses, lying on two or three pillows at night, taking treatment for hay fever/sinusitis, plus a general check up by your GP are recommended. Preventing UV damage to the skin around the eyes is also advisable by using creams with sun protection factor, sunglasses and hats. Finally, foundation is also useful in covering up the condition. Topical eye serums that contain a cooling gel as well as rice protein (unlike animal protein, rice protein is not an allergen and does not cause skin rashes and eye irritations), also help to stimulate drainage and condition the skin. In addition, Palmitoyl Pentapeptide, found in some eye creams, is a small molecule consisting of five linked amino acids attached to a fatty acid that enhances oil-solubility for better skin penetration. Moreover, Palmitoyl Pentapeptide is a precursor to collagen which stimulates key constituents of the skin matrix: collagen, elastin and glucosamnoglycans. Clinical data has revealed that Palmitoyl Pentapeptide is as effective as Retinol in repairing sun-damaged skin. And best of all, it is devoid of side-effects. Ensure that your vision is in top shape during the last weeks of winter and the onset of spring by making an appointment at De Jongh Optometrists – our friendly and professional team will ensure that your eyes are very well cared for!